Book Endorsement: The Doctrine of Scripture by Jason Harris – King James Only? Next Article What’s The Big Deal with Sam Gipp? It is great to see that the author of the book does distinguish between “KJBO” and “TRO”. In looking at the basic doctrines, it appears that the author does not actually lay the foundation of why he is quoting and interpreting Greek words as his starting point. What are the reasons why he is using Greek at all? It is evident that he is beginning not from Scripture, but from an external philosophical view of the past. That is, that he has a certain story — not the receiving of Scripture itself — to which he adheres. I suspect that the story goes like this: Many intelligent people have said that by comparing the Greek translation of the Old Testament (the LXX) with the Hebrew copies many differences may be discovered. Notice that this story is not actually a teaching of Scripture, but based on observation of external phenomena. But, they might object, people looked at copies of the Scripture and dated them and classified them. Notice that this is nothing to do with the meaning of the Scripture itself. Beyond that, assuming now that a person is accepting the Scripture as currently available to them in English, there is still anther massive problem. Instead of reading the Scripture as coming to us, they read it as if it must be limited to its original context/contemporary surroundings. Basically, they put on a Jewish mindset that uses the Hellenistic idiom and say, what would this mean to the original audience? By these three methods, then, the proper King James Bible only view can never be accepted. 1. 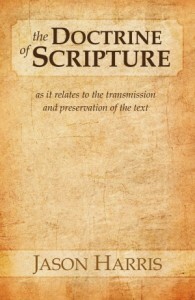 That God used Greek to inspire in, so Greek has some higher relative value; that humanly speaking, disparity arises by translation, therefore the Greek language ought to be examined primarily (as occurred in the Reformation); that best witness (either oldest copies or the majority of copies) in the same language must be the best or surest way of knowing the truth. All of this rejects using English alone as the source for study. 2. That since differences between the LXX and the OT Hebrew are said to exist, therefore God must bless imperfect copies, versions and translations, and in no way guarantee an accurate English Bible. All of this demotes the KJB to be just one of many Bibles. 3. That since the Scripture was written many hundreds of years ago, it must primarily relate to that time. And any golden age since, say, the Reformation, has now long elapsed. Anything better in the future is deferred to a far off perfect day. Today we are but unworthy, lowly men. All of this disempowers the reading of the KJB to from being living, present, powerful and true. It allows people to read the KJB as long as they wear blinkers. The formula appears like this: The Autographs were the Word of God; the KJB is a flawed representation of it. The KJBO approach is to begin from the Scripture itself as received and at hand, not locked away in Greek (as the TRO etc. treat it). It is a pity that the author (from reading the excerpts of the book) does not seem to address the basic paradigm, but already begins from the subject with all the assumptions which would negate recognising the perfection of the KJB. 1. Receive from the Providence of God the supply of His true Scripture, the KJB, today. Evidently it is in English, being God speaking by His Word today. 2. Examine the Scripture in English and believe it, and see that it has many verses indicating God’s supply of His Word perfectly, all of which self-authenticates the KJB as being the very Word of God. 3. Faith arises, seeing the great power and intervention and plan of God in history, and that He is speaking today directly to us by the KJB. So, when we read the Scripture in the KJB, we see it as fully true, “All scripture is given by inspiration of God, and is profitable for doctrine, for reproof, for correction, for instruction in righteousness” (2 Tim. 3:16). We don’t go to conjecture about the LXX or the mysteries of “theopneustos”. De 30:12 It is not in heaven, that thou shouldest say, Who shall go up for us to heaven, and bring it unto us, that we may hear it, and do it? De 30:14 But the word is very nigh unto thee, in thy mouth, and in thy heart, that thou mayest do it. Salute the brethren which are in Laodicea, and Nymphas, and the church which is in HIS house (Col 4:15)(KJV). Give my greetings to the brothers at Laodicea, and to Nympha and the church in HER house (Col 4:15)(ESV). His or Her? How can both be accurate? It possible that the personal pronoun in Col 4:15 really is feminine “autes” rather than masculine “autos” which would not make the ESV wrong. Go to the Greek and study it carefully. I’m not discretiting KJV but I’m no KJV only person. How do you know I’m not ESV-only? I did look at “the Greek” and they’re different, which is my point. (The RV even tranlates it as a plural (their house!). God inspired one or the other. WRONG!!! If Jason Harris and others believe what his book states, they need to read the “Revision Revised by Dean John William Burgon” (read page 513. This has already been dealt with and Burgon lays it all to rest. The Greek manuscripts underlying the modern versions were willing and deceitfully corrupted, so you cannot have “inspired scriptures in all English Bibles. That is a lie or one is ignorant of the facts.